I joined my union 40 years ago when I started my first proper job at William Hill, and with it my working world opened up. My union helped me find my voice. It helped me unlock new skills in myself and bring out the best in others. I was elected as a shop steward when I moved to gas company BOC aged 19, and my union helped me to not only find my voice but also to give a voice to others. There is no greater representation of the collective in action than a workplace pulling together around a common aim. When I became a union official for the T&G in 1988, it was hardly a bastion of equality. I was one of only six women officers out of hundreds, but I’m pleased to say things are very different today. There has quite rightly been significant progress in what is now Unite. Following a sustained programme of positive action we now have a number of women in key leadership positions across the union, including two women assistant general secretaries out of four, a woman executive officer heading up our hugely important organising and leverage work, three out of 10 regional secretaries who are women and four women heading up departments. But with women now making up 55 per cent of union membership in the UK, our movement must do better. My union is continually reviewing how we encourage more women – in particular from black, Asian and ethnic minority groups – to participate at every level, not just with rules on proportionality to make sure that all our constitutional committees reflect our membership, but also through training to build confidence. This is a vital part of succession planning – and it also includes specific training for women held by our political department to encourage active women to stand for public office as councillors and parliamentary candidates. In the south east region, where I lead for Unite, I am proud that we have a number of women leading our membership in sectors traditionally associated with men – in the docks, in civil air transport and in the automotive sector. We also have a fantastic community co-ordinator – another woman – uncapping the talent of our women members so that they can campaign in their communities whether it is to save their local Sure Start, defend women’s refuges (another thing cut by this shameful government) or stop their GP surgery from closing. For me, trade unions are the beating heart of our movement. So the theme of this year’s International Women’s Day – #PressForProgress – is tailor-made for our movement. It is a reminder that we have never, as a class and as a gender, ever been ‘given’ anything – from the vote to equal pay, we have always had to fight for it. And we are still fighting. More than a century on from the early days of IWD, women are still earning 18 per cent less than men. Last year, the World Economic Foundation reported that at the current rate of progress it would take another 100 years to close the gender pay gap. Women are still under-represented both in business and politics. 70 per cent of MPs are still male – although at 45 per cent, Labour’s equality policies are clearly working – but the Tory government refuses to address this inequality. The Conservatives claim it would put too many burdens on political parties to legislate for change. This shabby lack of ambition on the part of Theresa May and her cabinet means that Westminster – the mother of parliaments – is in the embarrassing position of being ranked 32 in the global listings for women’s political representation. Undeterred, we roll up our sleeves. We know that the Tories won’t act but our movement will. The role of unions in getting women into Labour politics is now more important than ever. Some very talented women are now Labour MPs and shadow cabinet members –Angie Rayner, Kate Osamor, Marsha de Cordova and Laura Pidcock, to name but a few – are there because their unions helped them to nurture their gift for representation and find their voice. To my fellow women trade unionists: keep believing that you can make a difference and your union will help you to achieve your true potential. All unions including Unite offer a huge variety of training and education courses to help our members broaden their skills and play a more active role in their workplace, as well as in the wider political world. That iconic image of Rosie the Riveter sends out a clear message to us all – ‘a woman’s place is in her union’. 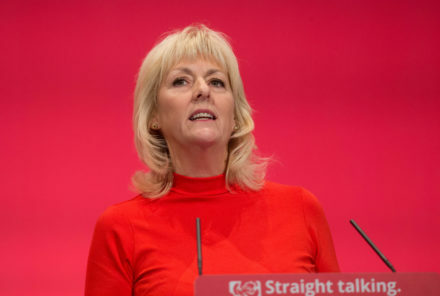 Jennie Formby is regional secretary for Unite in the South East.